Taylor Morrison offers stunning Vercelli Garden Condos at our Esplanade Golf and Country Club at Lakewood Ranch community.Take A Virtual Tour of the Vercelli Garden CondosFabulous Resort-Style Amenities Experience a new level of inspired living and enjoy an exciting array of resort-style amenities. From active recreation to relaxing pursuits, Esplanade Golf & Country Club has something for everyone. The community is nestled on approximately 600 acres among lakes, nature preserves and wetlands. The residents have access to on-site facilities, including a heated lagoon-style pool and spa, resistance pool, outdoor barbecue space, fire pit, Pickleball and Bocce courts and more…all accessible by golf cart. The centerpiece of Esplanade is a beautifully appointed Amenity Center, complete with fitness and aerobics center, grand ballroom, card and craft room, catering kitchen, billiard room, and library. Miles of walking trails with gazebos crisscross the community, and there is even a formal events lawn, fitness lawn, canoe and kayak launch, fenced bark park, and adventure playground. 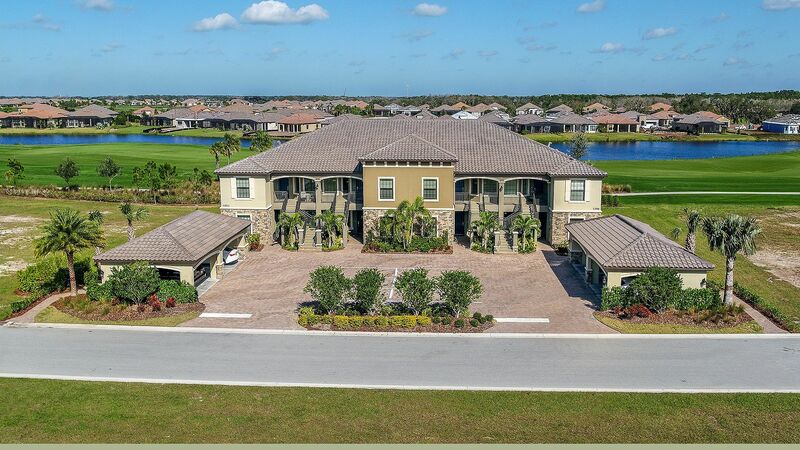 Residents of Lakewood Ranch can find nearby gourmet and family-friendly restaurants, unique shops and boutiques, a hospital and medical center, plus much more. There are over 150 miles of sidewalks and trails, community parks, lakes and nature preserves abundant with native wildlife. It’s just a short drive to airports, beaches, cultural activities and entertainment Taylor Morrison's Esplanade communities offer beautifully appointed homes, inspired by California Tuscan architecture. Our Vercelli Garden Condos are built to Taylor Morrison's high standards of quality construction and design.